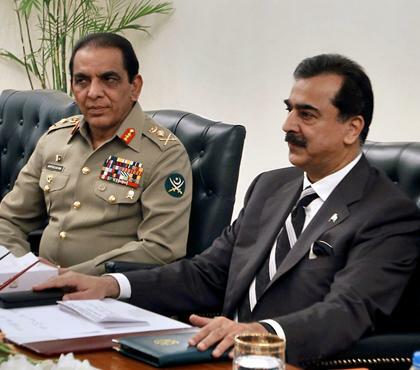 Prime Minister Yousuf Raza Gilani today chaired a meeting of Pakistan’s top civil and military leadership ahead of the resumption of a trilateral initiative with Afghanistan and the US to boost the Afghan peace and reconciliation process. The meeting held at the Prime Minister’s House this evening was attended by army chief Gen Ashfaq Pervez Kayani, ISI chief Lt Gen Zahir-ul-Islam, Foreign Minister Hina Rabbani Khar and Interior Minister Rehman Malik. “The meeting took stock of recent developments in the region,” said a statement from the premier’s office. The leadership discussed “matters related to Afghan peace and reconciliation and new terms of re-engagement with the US, NATO (and) ISAF in accordance with recommendations of the parliament”, the statement said. Among others present at the meeting were Defence Minister Chaudhry Ahmed Mukhtar, Finance Minister Abdul Hafiz Shaikh, Pakistan’s Ambassador to the US Sherry Rehman and Foreign Secretary Jalil Abbas Jilani. The meeting was held a day ahead of the first meeting of the Core Group of Afghan, Pakistani and American officials since September last year. The work of the Core Group was affected by the assassination of Afghan High Peace Council chief Burhanuddin Rabbani in September and a cross-border NATO air strike in November that killed 24 Pakistani soldiers. The sixth meeting of the Core Group will be held in Islamabad during April 26-27, said a statement from the Foreign Office. The Pakistani side will be headed by Foreign Secretary Jilani while the US team will be led by Special Representative for Afghanistan and Pakistan Marc Grossman. Deputy Foreign Minister Jawed Ludin will lead the Afghan delegation. “The meeting would review various issues of common interest, including the Afghan-led and Afghan-owned peace and reconciliation process, economic development, narcotics, return of Afghan refugees and regional connectivity,” the Foreign Office said. Pakistan-Afghanistan relations were hit after Afghan officials said last year that elements in Pakistan were behind the assassination of Rabbani. The two countries also exchanged charges over a string of attacks on Pakistani border posts by Taliban fighters based in Afghan territory. The NATO air strike effectively halted cooperation between Pakistan and the US in efforts to find a solution to the problems in Afghanistan. Pakistan closed all routes used to ferry supplies to US and foreign troops in Afghanistan and forced American personnel to vacate an airbase that was considered a hub for CIA-operated drones. After the Pakistani parliament recently adopted new guidelines for relations with the US, the civil and military leadership recently decided to conduct negotiations with the American administration on reopening the NATO supply routes and future counter-terrorism cooperation. This entry was posted in News and tagged Afghan Talks, DCC, Gilani, Pak Army, PM Gilani. Bookmark the permalink.